The cult of the Persian God Mithras, a Zoroastrian deity, began to spread rapidly throughout the Roman Empire in the first century C.E., based on its huge popularity among Roman troops. In its heyday, the cult became a major challenge to another rapidly growing religion, early Christianity. The Mithraic Mysteries were a secret society inspired by an Ind-Iranian angelic divinity known as Mithra or Mithras, who was believed to be born from a rock. Portrayed as a saviorlike god, Mithras was often shown in the act of slaughtering a sacrificial bull, or sharing a banquet with the sun god, Sol. The Mithraic Mysteries were an exclusive cult that required all applicants to pass seven levels of initian before they were considered fully vested members or 'syndexioi' "sealed by a handshake." Its worship took place in a cavelike space, about 75 feet long and 30 feet wide, known as a 'mithraeum.' Here, up to 30 worshippers could share a meal of bread and wine in front of an effigy of the god slaying a bull. The initiation process was extremely complex. For the first three phases, the applicant was an initiate only. Only at the fourth level was he allowed to share in the sacred bread and wine. At the seventh and final phase, he was truly considered a pater, or "father," of the cult. There are obvious similarities between the Mithraic Mysteries and early Christianity, including the idea of worship around a meal in a dedicated space or chapel; the sharing of sacred bread and wine; the idea of heaven as a reward for the righteous, and hell as punishment for the wicked; and the celebration of December 25 as a sacred holiday (perhaps inspired by the cult of Sol, which marked the date as the winter solstice). The Mithraic Mysteries posed a strong challenge to the growth of Christianity during the first and second centuries C.E. 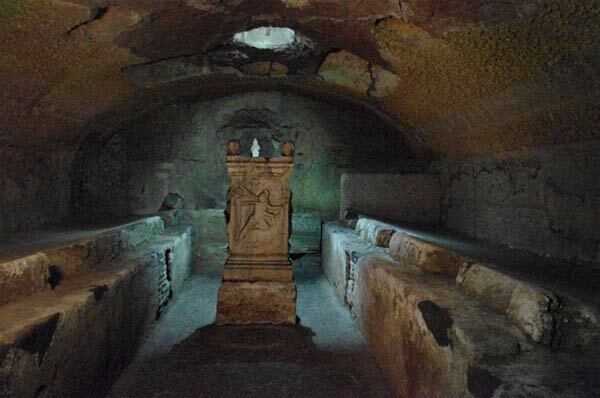 Its popularity is attested by the fact that archaeologists have uncover more than 420 sites associated with Mithras, while over 45 private Mithraea or 'Mithras Chapels' have been discovered in Rome alone. the ox is one of Eden's 4 cherubs . to invert our reality . More important, then and today, than is generally realized. But again, and to quote the above author, the organization is only open to professional killers and deeply hates women, look up the mythology. I would suspect anything of them, or of their Templar successors, or of Cave-men from Hamburg, where the All-father resides.